A while ago I was looking into tail clearances on takeoff, rotation technique and most importantly what tools were available to train and evaluate rotation technique in the simulator and the aircraft. 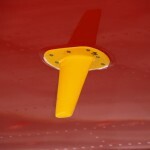 As part of this review the question was raised about the calling of “Rotate” on takeoff and the initiation of the rotation manoeuvre itself. 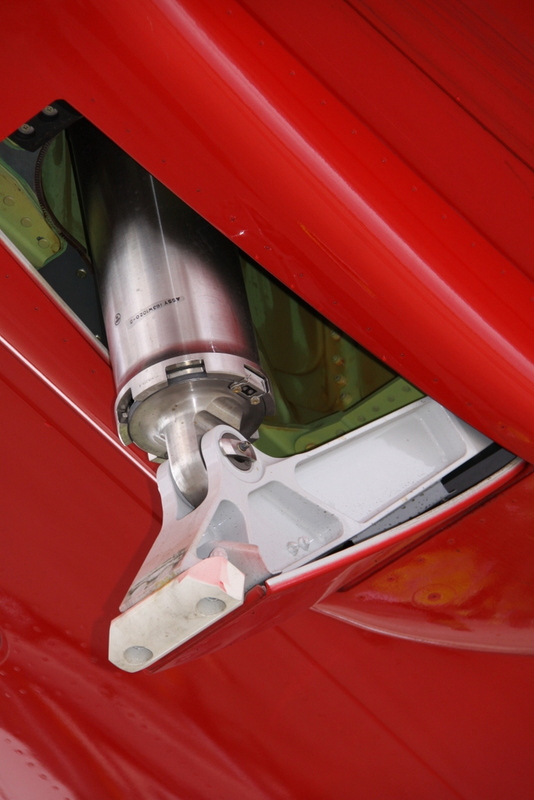 It seems an esoteric distinction but when the takeoff is critical – high weight, high density altitudes where limitations such as maximum tyre speed become a factor – it can be part of the problem of rotation technique. Before you read on, answer honestly the following question – When do You start to pull back and initiate rotation on takeoff? When the airspeeds indicates you’ve achieved VR? The answer of course comes from the FCTM. The requirement for the PF to initiate rotation at VR rather than “Rotate” has some implications for takeoff. If you weren’t already – as the PF you should have airspeed in your scan (along with everything else) during the takeoff roll, particularly as you approach V1/Vr. Essentially as you hear the PM call “Rotate” – you should have already begun the control input; you should not be reacting to the call. It’s a small difference (made bigger by any delay in the PM (Captain!) to call “Rotate“) but with the odd tyre speed exceedence seen in Abu Dhabi in the summer and occasionally Los Angeles at heavy weights – a difference that can bring you closer to an exceedence. This concept provoked some discussions amongst the standards guys as to whether we should be calling “Rotate” a few knots early. Again – referring to the FCOM/FCTM – the answer is … No. Years ago when my previous operator transitioned from the awesome Boeing 777-200/ER’s to the even more awesome B777-300’s – prior to the ultimately awesome (… at least until the 777-X!) 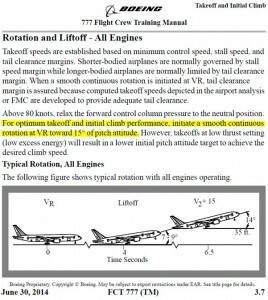 B777 300ER’s – we were concerned about the rotation technique our pilots were using in the -200 aircraft and how that would translate across to the far more critical -300 aircraft. I promise I won’t call anything else awesome for the rest of this page. While training was provided in the simulator to Instructors (to teach/assess) and to Line Pilots (to do!) on takeoff rotation to refresh them in preparation for the -300’s; one of the most effective solutions was produced by Engineering. 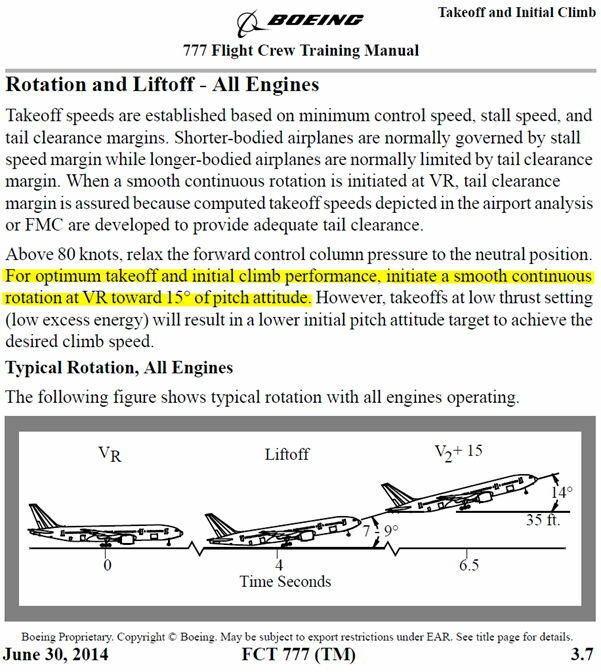 After each takeoff in the aircraft, the onboard maintenance computer would print off a takeoff rotation report which listed some of the basic parameters associated with the rotation itself and allow the pilots to compare their own impression of the rotation manoeuvre as against the data itself. Pilots were heavily cautioned against reading too much into the data and reminded that the prime reference was the FCTM technique – but it was fascinating how often a rotation that felt slow, looked slow on the data; felt fast, looked fast on the data – or felt ok, looked slow or fast on the data. Over time we trained into our brains and muscle memories the correct technique using the aircraft itself as our guide. Quite cool really. As an aside, I can remember several tailstrike incidents in the B777-300 (never the 300ER) during my time with my previous airline; all involved some fairly (not so) unusual (UK) weather with strong/gusty crosswinds involved. While information was never provided as to whether pilot technique was a factor – knowing as I did at least three?of the pilots in those occurrences, I really don’t think so. Later the FCTM would be changed to recommend full TOGA thrust on all takeoff’s in strong and/or gusting crosswinds in all 777’s – an action which increases the tailskid margin on takeoff. When the 777-300ER’s arrived they came with a software based tailstrike prevention system that would all but eliminate tail strikes. In fact to the best of my knowledge no 777-300ER’s have experienced a tailstrike in operational service – and the system had to be disabled during certification in order to produce the data necessary for unstick tests. 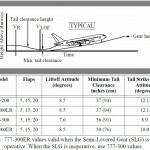 B777-200/ER/LR/LRF : Has tailstrike detection – but no protection. B777-300 : Has tailstrike detection; separate tailstrike protection (physical tailskid); but no software based protection. B777-300ER : Has detection; Tailskid Protection (tailskid); plus a software based protection system and semi-levered main gear which pivot during rotation to reduce the likelihood of a tailstrike. 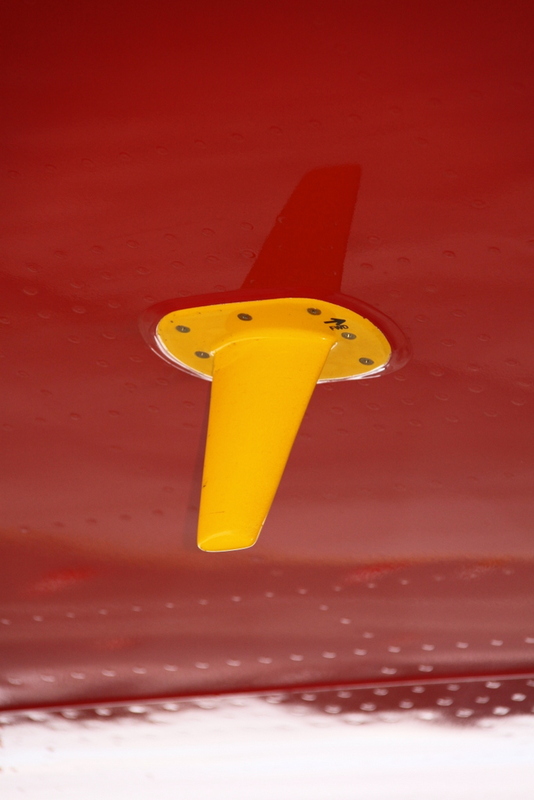 The detection system is a sensor/antenna mounted on the underside of the aircraft, not far past the point where the lower body tapers upwards towards the tail, and when activated alerts the flight deck that a  TAILSTRIKE has occurred. This system is highly sophisticated, so to understand it – you need to read the next paragraph carefully. Basically if you pull back hard enough during takeoff and drag the back end of the aircraft along the runway – you rip off this strategically placed orange fin, and an EICAS message goes off on the flight deck. Highly sophisticated, wouldn’t you say? Still it seems to work. 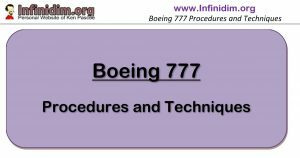 In the event of an activation of this system – on any 777 – the checklist requires you to depressurise the aircraft and Land. Potentially you’ve done damage to the airframe, which could well be structural and include the cabin pressure cell. The 300ER’s come with a software innovation that assesses the likelihood of a tailstrike during takeoff based on a sea of parameters that include not only tailskid height but pitch attitude, rotation rate, airspeed as well as pilot control inputs. This is a solution that is a direct benefit from a fly by wire control system – there’s no doubt a stack of software in the background operating on a stack of data coming in at (I believe) 60 frames of information a second. 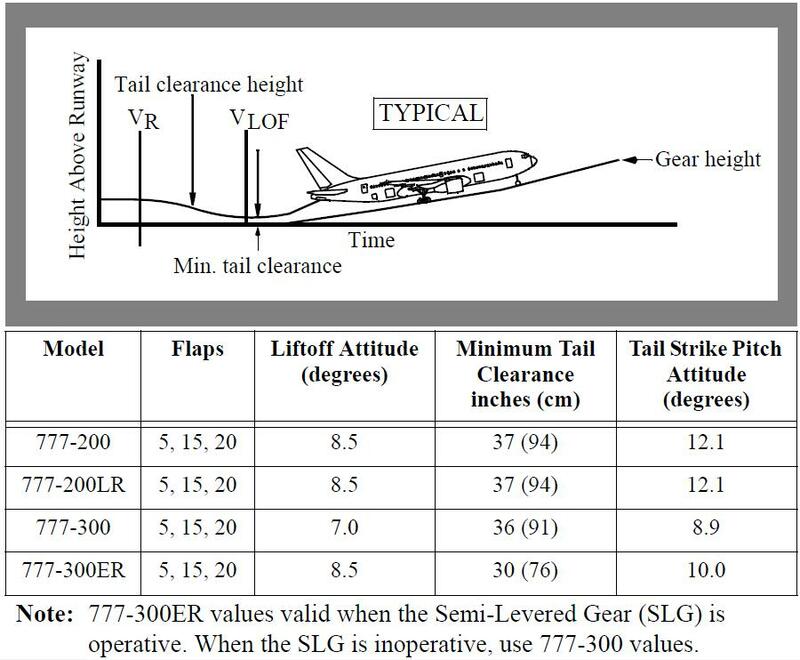 Basically the system calculates how low the tail skid will be at the lowest point in the rotation – and if it believe that clearance will be less than 1.5 feet (yes – that’s 18 inches folks …) – it springs into action. Effectively?it reduces the pilot commanded elevator input, slowing the rotation of the aircraft, thereby preventing a tailstrike while continuing the rotation manoeuvre. There is no pilot feedback, and no advisory to the crew that this has taken place. Depending on your airline’s setup – the flight deck, Engineering and/or Flight Operations Department could receive a report from the aircraft that the event has taken place, incorporating a subset of the data generated during the activation of tailstrike prevention. Additionally an airline’s flight data monitoring (FDM) program that monitors digital data continuously for exceedences in a variety of parameters may well detect in the takeoff data indications an execeedence of various values such as fast/slow rotation rate; high rotation pitch attitude at liftoff, etc. It’s worth noting however that FDM captures data at about 5 times a second whereas TSP works on at least 12 times as much data – I’ve seen circumstances where the TSP has activated, but FDM never caught anything unusual (enough) on the takeoff to report. 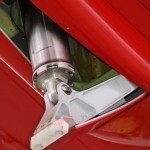 * Finally – it’s worth noting that the software solution on the 777-300ER is so good that recently Boeing stopped placing the physical cannister tailstrike protection solution on the -300ER’s; this protection originally provided on the 777-300’s is no longer required and Boeing have been looking at rolling the software system back to the 777-300’s.